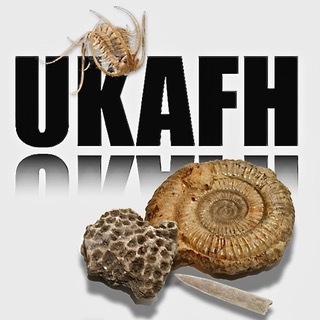 On Sunday 13th May UKAFH met at Barton on Sea in Hampshire, a coastal village a few miles east of Bournemouth. Before heading onto the beach, Chris Tait provided examples of likely finds and explained the area’s geology and paleoenvironment. The cliffs and slippages here comprise the Barton Beds, a series of clay and sandy clay that was deposited about 36 million years ago during the Eocene epoch in what was a warm shallow sea. The sea would have been further south during the Eocene epoch, similar in latitude to modern day Spain and so the climate considerably warmer. We were very fortunate to be provided an example of warm weather as the day was bathed in sunshine and temperatures pleasantly mild. The warm, shallow Eocene sea was a rich ecosystem and the clay provided a great medium to preserve the remains of creatures that lived there which means the area is incredibly fossiliferous. The area is noted for having over 600 named species of bivalve and gastropod and is also particularly abundant in shark teeth and fish remains. We ventured down from the carpark to the beach which, in such fine weather, is very popular with tourists. We began by investigating the base of the clay slippages. Although ill advised to dig into the slippages, on the surface of the clay are many fossils already washed out. These include a whole variety of shells, especially bivalves which can be particularly ornate. Everyone found a variety of different species of gastropod. The shells here can be quite fragile, so it is important to bring a box, preferably with some padding to protect the specimens. Later in the afternoon, many of us stopped for lunch which was an ideal opportunity to sit on the shingle and rootle through the flint pebbles in search of shark teeth. Once we got our eye in, many great examples of shark teeth were found, predominantly of the Striatolamia genus and Sam Caethoven found the dental palate of a fish, one which would have had shell crushing teeth, ideal for feeding on the abundant gastropods an bivalves here. Later in the day, Chris Tait led a small group up onto the slippages to get a better look at the geology. It is extremely important that care is taken when on the slippages and it is not advised this is attempted without a guide as it can be easy to become stuck in mud. Evidence of this danger was provided by a number of abandoned wellington boots! Thank you to everyone who attended and a big thank you to Chris Tait and Sam Caethoven for leading the hunt. I hope you all had a great time! Left to Right: UKAFH leaders Sam Caethoven, Aidan Philpott, Chris Tait and Nicky Parslow. This entry was posted in Reports and tagged barton on sea, clay, fossil, gastropod, hampshire, shark, teeth.